With sincerity and hard work of our professionals, we have carved a niche for ourselves in this domain by offering Bio Safety Cabinet. 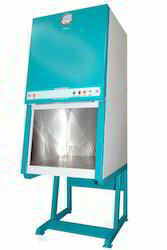 At our production unit, this cabinet is manufactured using optimum quality components and latest techniques under the strict guidance of dexterous engineers. To eliminate any kind of defect, this cabinet is examined against several measures of quality by our quality examiners in synchronization with defined industry standards. HEPA filters should be MINIPLEAT with 99.99% efficiency for 0.3 micron with integral metal guards & filter frame gaskets and manufactured in class 1000 super clean air conditioned environment for longer life. Should have Rehabitable pre filters should have efficiency of more than 80%. Karl Fishcer Automatic Apparatus Processer Karl Fisher Titrator ( Graphical Display) with built in magnetic stirrer, Auto computation of moisture in ppm % and mg H2O, simultaneous display of results in all three units, 1000 sample stirage facility with bath no, Final result are flashed n 128*64 premium graphical LCD, icon based Menu for easy navigation. 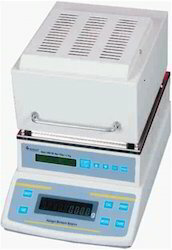 K.F reagent dispensing by motorized process, Highly accurate & reliable. Auto Karl Fisher Titrimeter having array of LED’s provided with inbuilt stirrer, auto zero burette, adjustable timer, dual platinum electrode & other accessories Apparatus 25ml burette, 250ml titration beaker with dish cover, 2-electrode & solenoid valve, 2 pcs apparatus. Stirring portion provided separately to prevent spillage of corrosive regent on main electronic circuit box & for easy maintenance. Minimum detect ability of moisture 0.25mg Accuracy± 0.125 mg. Easy to handle the apparatus as less glass parts are used. Specially designed continuous duty positive displacement peristaltic pump is used to dispense reagent & methanol in to reaction vessel. Reversing facility available to transfer the reagent from the tubing back to reservoir. Digital readout to avoid human reading errors. 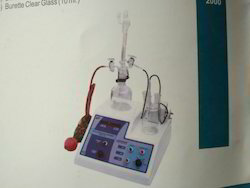 Karl Fischer Titrator finds use in chemical, pharmaceutical, food, cosmetics, oil and many other industries in Q.C. and R & D laboratories. Power Supply 220/240 V Single Ph, 50 Hz AC. 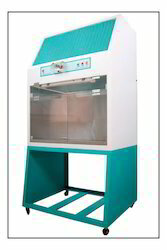 Our Athena GMP model, Laminar Air Flow Chambers are available in Vertical as well as Horizontal Models and used where high-tech manufacturing and assembly takes place and thus widely found in semiconductor assembly, biotechnology, pharmaceutical, aerospace, food, medical devices and hospitals. These Laminar air flow chambers are tested on various quality parameters to ensure smooth functioning and manufactured with Class 100 airflow in the work region in accordance to US FED STD 209. HM: Horizontal Model/VM: Vertical Model. Designed & widely used in application & tests of Electronic/Electrical components, Plant and Animal growth studies, and Shelf life studies in Pharmaceutical & Packaging sector & Other Q/C Labs under controlled temperature and humidity conditions. Double walled having Argon welded Inner Stainless Steel -304 grade chamber and Exterior with CRCA Steel - Powder coat finished. Castor Wheel for easy movability. Full view observation Acrylic door to observe sample inside the chamber. Illumination is provided through fluorescent tubes for clear visibility. Controller & PT – 100 sensor for temperature & Humidity sensing. High Efficiency CFC Free Cooling system includes Hermetically sealed Emerson Copland make compressor coupled with air cooled condensing unit fitted with Motor, Fan Blade, Electrical Accessories etc. Mounted on bottom of unit on heavy base frame. Humidification through steam injection system. Redundant high temperature safety system automatically cuts-off power to heaters if temperature exceeds 70°C. A Boiler Tank consisting of Water Heater having auto cut-off facility for low water level. Inbuilt Overload protection relay for compressor. With hard-earned experience of our adept professionals, we offer a precisely manufactured Halogen Moisture Balance to our clients. Our offered balance is widely acknowledged for its exact result and durability. Our adroit professionals manufacture this balance with utmost care and precision using high grade components as well contemporary techniques. In addition to this, our quality auditors test the offered balance against predefined parameters for ensuring its functioning. Our vertical laminar air flow has vertical direction flow and particle retention above 0.5 micron. These are appreciated for their low noise and versatile usage. These have been designed with latest technology and can also be designed as per the specifications, provided by our clients. The vertical laminar air flow cabinets is designed to provide a high degree of protection for process products In laboratories and production facilities. Many critical applications in the medical, pharmaceutical, nuclear-power, and micro electronic fields demand an ultra-clean work environment which is free from biological and particulate contamination. The cabinets are fabricated out of thick board duly sunmica clad or mild steel cabinet duly epoxy coated. The work table is made of thick board which is sunmica clad at top or S. S Table top will be provided as optional accessories. All joints are sealed with silastic sealant. Side panels are provided of thick transparent acrylic sheets. The unit is fitted with pre-filter and is made to pass through highly effective HEPA (High Efficiency Particular Air) filter having efficiency rating as high as 99.997% with hot, DOP, thus retaining all air-borne particles of size : 0.3 micron and larger. Using a dynamic machine, the blower and motor assembly is statically and dynamically balanced. Blowers are mounted on vibration isolation mounts to minimize vibration. The working is illuminated by fluorescent lightings fitted to the unit. Height of the working table provides comfortable “ Sit Down” working position for the operation to work on 220/230 volts AC. supply. 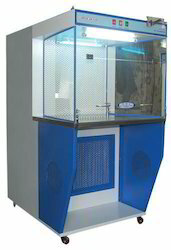 A Laminar Flow is designed to provide working space comprising as standard features HEPA filter having efficiency of 99.97% down to 0.3% microns,prefilter 90% down to 5 microns, suitable motor blowing assemblies, working table topside Acrylic panel, fluorescent tube light & pressure differential Manometer. Inside shelf made of S.S. Body of the Mantle made of spun joint less Aluminium. Heating element knitted fibre glass netting Properly insulted. Long lasting element made by nichrome wire. Non breaking nichrome connection having porcelain beeds covered to net. 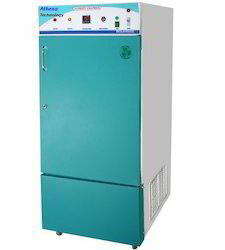 An Vertical Autoclaves is a pressure chamber used to carry out industrial processes requiring elevated temperature and pressure different from ambient air pressure. Autoclaves are used in medical applications to perform sterilization and in the chemical industry to cure coatings and vulcanize rubber and for hydro thermal synthesis. 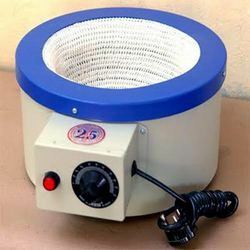 They are also used in industrial applications, especially regarding composites, see autoclave (industrial). 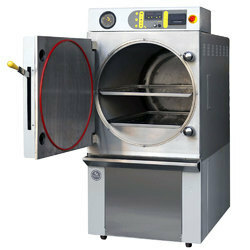 Many autoclaves are used to sterilize equipment and supplies by subjecting them to high-pressure saturated steam at 121 °C (249 °F) for around 15–20 minutes depending on the size of the load and the contents. The autoclave was invented by Charles Chamber land in 1884, although a precursor known as the steam digester was created by Denis Papin in 1679. The name comes from Greek auto-, ultimately meaning self, and Latin clavis meaning key, thus a self-locking device.